It had been a longtime dream for Joe, a film critic for the Wall Street Journal, to come to Japan. 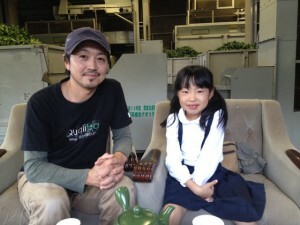 He came to the countryside for an authentic Japanese experience and personal interactions with local artisans. 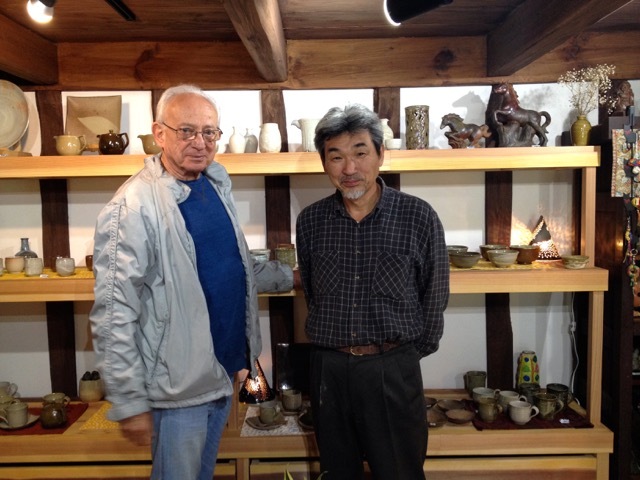 Visited Mr. Kaoru Miyazaki, a potter living in Nishiawakura Village. 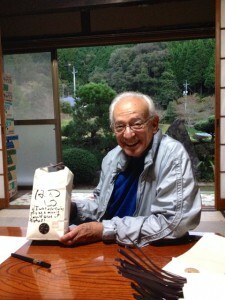 Mr Miyazaki sources local clay with high iron content which appears as spots giving his creations a unique trademark. He also uses local thinned needle-leaf wood for firing instead of the standard pinewood making the firing process more environmentally friendly. 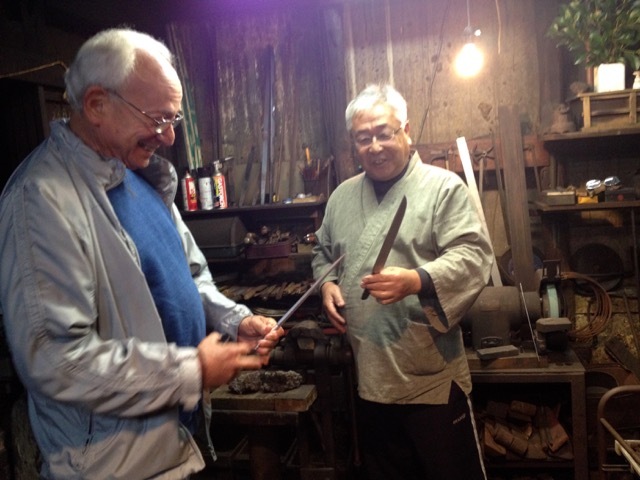 Mr. Hirokiyo Ando, a sword maker, is a designated “Prefectural important intangible cultural property”. He is never without a smile and always happy to answer questions. 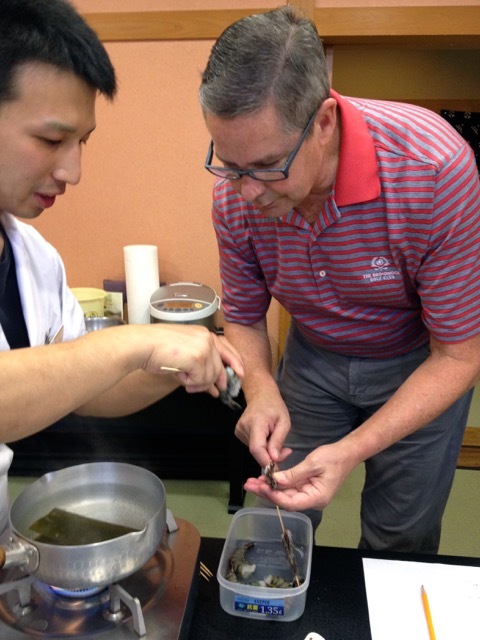 Mr. Ando has been pursuing for the last 35 years to find and revive the techniques used back in the 13th century to create the highest quality swords. Mr. Keiichiro Shimoyama is a 3rd generation tea master who has worked hard to breathe life back into Japanese tea culture in the Okayama region. 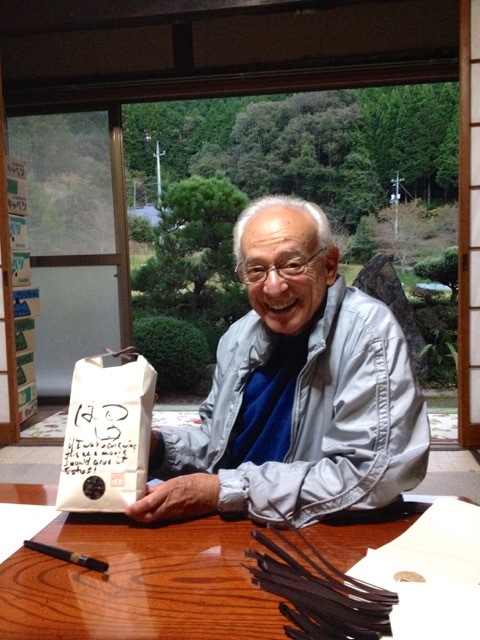 After he took us through each stage of tea processing, Mr. Shimoyama invited Joe to write his own tea packaging with a calligraphy pen. Can you read what he wrote? Joe gave the tea “5 stars”!! Mr. & Mrs. Taylor spent 3 days with us trying out a range of hands-on traditional activities unique to the northern Okayama area. As experienced travellers in Japan who have also lived here in the past, they chose our tour to go further in their journey to discover lesser-known gems hidden in the Japanese countryside. Mrs. Kashimoto who has a real passion for kimono explained how the threads are dyed in a mathematical way in Sakushu kasuri unique to the Mimasaka area, to reveal a final design. Mrs. Taylor made a placemat in about one hour. 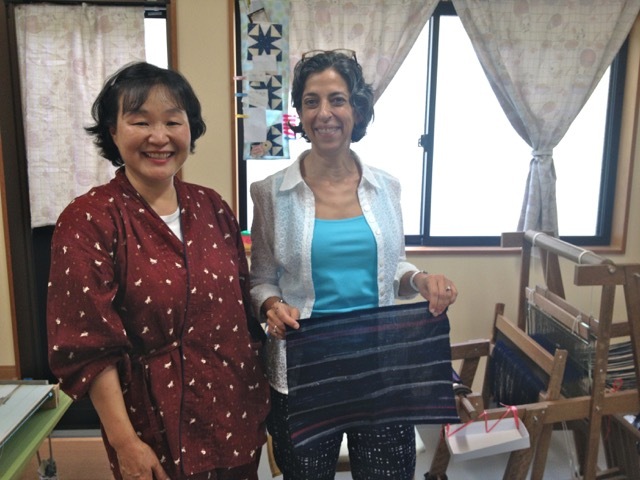 Here guests can also purchase handmade cotton fabric woven by Mrs. Kashimoto herself at reasonable prices. 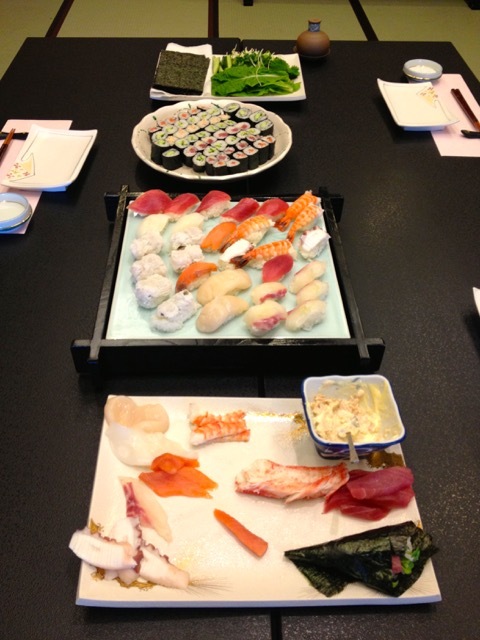 Mr. Nishimoto is one of the youngest yet one of the most creative chefs in the team at Kifu no Sato. The couple spent a leisurely 2-and-half hours making miso soup and three types of sushi using prawn, smoked salmon, dagger-toothed conger, squid, tuna and salmon roe. The chef’s educational talk ranged from the different types of knives to his training days. Mr.Isezaki’s works are known for their classic beauty deeply rooted in the Bizen tradition. Kyo-san guided the couple to make coffee mugs on a potter’s wheel. The guests’ creations were shipped to them after the firing process in the wood kiln. 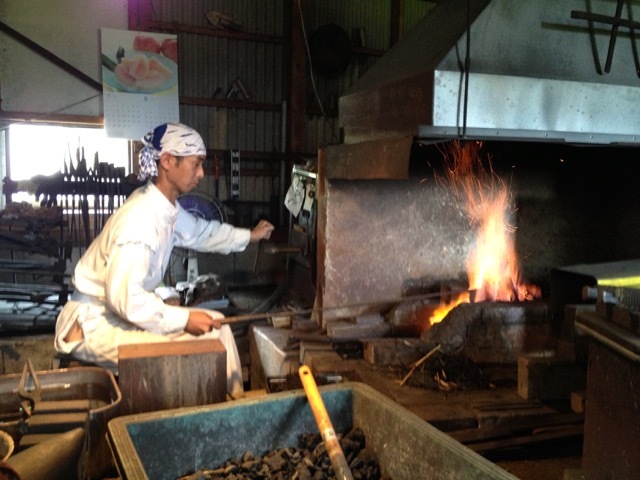 Osafune town in Okayama has been renowned for its quality sword production for centuries. Attracted by its style, Mr. Ichijo Kawashima who is a 15th generation maker of swords moved here from Kochi Prefecture. Allowed into a workshop considered “sacred” and to see the forging process is a real treat. The couple learned that a lot of a swordsmith’s work is about forging his spiritual self as much as polishing his technical skills. 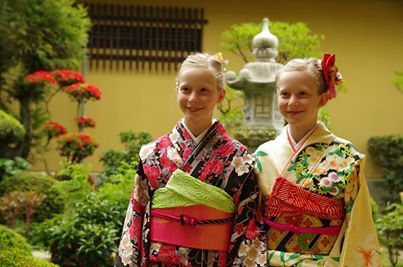 One of our staff will put the kimono on for you and take a professional photo as a memento of your stay in Japan. Please book the session in advance. To find out more about this service, please send us a message. Kifu no Sato in the north of Okayama has been chosen as a quality luxury ryokan to participate in the ILTM(International Luxury Travel Market) in Kyoto in March 2013. The ryokan will introduce its own “samurai culture” tour at this event. We offer a bespoke tour with an English-speaking guide visiting historical places such as the birthplace of the world-renowned samurai, Miyamoto Musashi. There one can see a demonstration of the martial art of iaido (sword-drawing techniques) as well as trying it for oneself. Okayama is famous for Osafune “sword” Town where one can learn how Japanese swords are made directly from the swordsmiths. 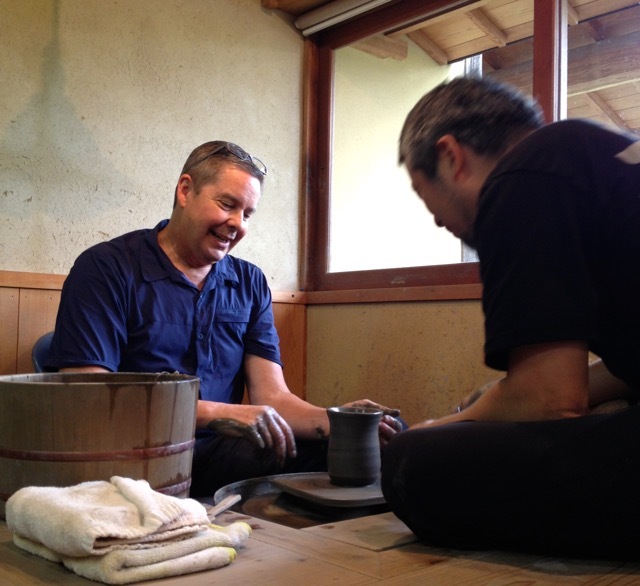 Also the samurai aesthetic of “wabi sabi” is eloquently captured in Bizen Pottery which our guests (can try their hands at) under the guidance of a master. In addition, we provide a meal as eaten by warlords, a visit to a local sake brewery and for those who wish they can even put on samurai armor to get an insight into their intriguing history and culture. Please go to the Attraction page for further information.